Do you want to start living a cleaner, greener eco-friendly life, (the one better for the environment and future generations), but not exactly sure how you can incorporate it in your bathroom? No worries, because we're here to help! Here are some really great products that can help you go green - in your bathroom. 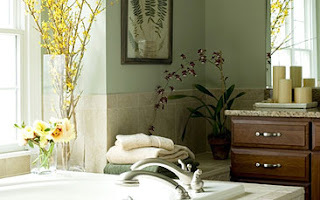 This is the best place to start when making your bathroom greener. The appliances and fixtures you will replace your old ones with will save water, energy, and still work just as great as your old ones did! A few things you can do is install dual flush toilets and low flow shower heads. Why? You're toilet actually uses more water than any other appliance in your house- somewhere around thirty percent of all the water you use, in fact. Dual-flush toilets have different settings for when you go, so you don't waste excess water just because you urinated. Replacing your shower head with a low flow one, is another way to easily conserve water. Replace your old shower curtain for a green shower curtain. These shower curtains have been designed to last longer, and are most typically made out of completely organic materials that won't harm the earth. Make sure you buy a shower curtain that is made out of hemp or washable fabric - or you can replace them with glass or plastic doors. You can also choose to replace your old bathroom towels with new, completely organic ones. Rawganique offers a line of plush, luxurious bath towels that are made from 100% organic cotton. (They have bath mats and rugs that are also made from the same organic materials as well. Remember that you're trying to go organic if possible, so don't just throw your old towels away. Instead, rip your old towels up and use them as kitchen and cleaning rags. This one is simple. Use recycled toilet paper! It sounds gross, but it's not actual toilet paper that's been recycled - it's other stuff that isn't quite as gross. It might cost you an extra 45 cents, but it's well worth it in your quest to become more Eco-friendly in the bathroom. Besides, buying brand new toilet paper without any recycled content in it usually means that you are supporting the destruction of old growth forests- you know, the ones that take hundreds of years to replace? Dr. Bronner's Magic Castile Soaps - 25 uses in 1! Clean your entire house, do laundry and wash your body, face and hair too. Great for baby, kids and the entire family! Online and instore at Target. Do you have some eco-friendly tips or products to share? Leave me a comment in the comments section below. I can't wait to hear what you have to say! Guest post by Amanda Green. Authro Bio: Amanda is a makeup fanatic and writer for SkincareHQ.org which recently featured a guide on the Best Foundation For Acne Prone Skin. Aside from makeup, Amanda enjoys travelling and playing with her dog Sadie. If you have questions or comments for Amanda, feel free to connect with her @Skincare_HQ on Twitter!